When it comes to comfort food, sandwiches are the best. Few slices of bread, a couple of vegetables that can be roasted and some seasoning will do. In just few minutes, you can cook up a sandwich that is healthy, tasty, colorful and wholesome. There are days when I don't feel like having regular rice for lunch. Those days, I would keep my lunch simple. Just a one pot meal like vegetable pulao, a sandwich or a soup will do. I pair my sandwich with soup when I use raw vegetables for my sandwich. 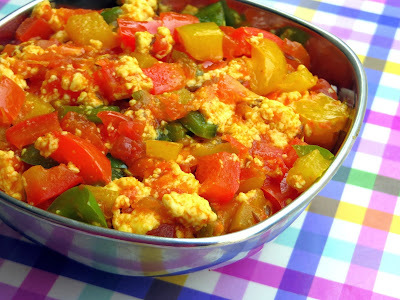 This tri color capsicum/bell pepper and paneer burji that I used as a stuffing for my sandwich is well cooked and can be paired with raw vegetables like sliced onions, chopped cucumber and sliced tomatoes. Few people have a flair for Ketchup. They have the habit of squeezing a dollop of ketchup on any bread based food like pizza, sandwich etc. This sandwich can also be served with ketchup. I have tossed in some crumbled paneer to the roasted vegetables for an extra protein kick, so that will keep me full for a long time. There is no onion and garlic in the recipe. Adding them is optional. Here's the recipe. Dice the tomatoes and the bell peppers/capsicum and keep it aside. Heat oil in a kadai. Add Jeera and finely minced green chillies. Add tomatoes and fry until it becomes mushy and water is almost absorbed. Add the capsicum/bell pepper and fry for a minute. Add turmeric powder, salt, sugar, red chilli powder and saute the capsicum for a couple of minutes. Do not overcook the capsicum. Turn off heat and mix in the crumbled paneer and coriander leaves. This burji can be used as a side for rotis and also as a stuffing for parathas. I have used it as a stuffing for my sandwiches. allow the content to cool. Heat up a sandwich maker. Preferably a grill sandwich maker. Alternatively, you can use a grill tawa or even ordinary tawa to toast the bread. When the sandwich maker is preheated, place a slice of bread. Spoon in some burji and spread it across evenly. Lay another bread slice on top and drizzle a spoon of ghee. Close the lid and toast for a couple of minutes, until the bread slices are toasted golden. Turn off heat and transfer it to a plate. Using scissors/kitchen shears half the sandwich. Serve it hot with ketchup and some chopped onions, cucumber etc. 1. Use your favorite vegetables. Thinly sliced capsicum, onion and even eggplant will be fantastic. 2. Place a cheese slice and let it melt with the vegetables when pressing the sandwich. 3. Use masala powder like paav bhaaji masala or kitchen king masala or any masala powder of your choice for seasoning instead of red chillie powder and green chillis. 4. Use brown bread if you are diet conscious, but white bread tastes best.